Quickly halting an in-progress action that turns out to be inappropriate for a particular time and place relies on a cognitive function known as inhibitory control. In new experiments with rats, researchers have discovered a set of neurons at the base of the brain that are critical for this rapid behavioral stopping, demonstrating that inhibitory control involves a broader network of brain circuits than those previously associated with the process. Determining how the brain stops inappropriate behaviors is important for understanding conditions in which inhibitory control is impaired, including Parkinson’s disease and ADHD (attention-deficit hyperactivity disorder), as well as normal aging. The new study, reported September 14th in the journal Nature Neuroscience, was led by Shih-Chieh Lin, M.D., Ph.D., a 2008 and 2010 NARSAD Young Investigator whose lab is at the National Institute on Aging, and its first author was Dr. Jeffrey D. Mayse of Brown University. Drs. Geoffrey M. Nelson, Irene Avila, and Michela Gallagher also contributed to the research. 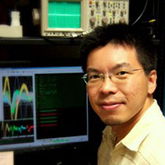 While most studies of inhibitory control have focused on a neural circuit in a structure implicated in controlling movement called the basal ganglia, Dr. Lin's team wanted to know if parts of the brain beyond this circuit were involved in behavioral stopping. They focused their attention on a set of neurons in a structure at the base of the brain called the basal forebrain. Their studies showed that neurons in the basal forebrain that exhibited bursts of activity in response to the go signal quickly stopped firing once a stop signal was detected. The faster these neurons settled down in response to the stop signal, the faster an animal was able to change its behavior. In fact, the scientists could even get an animal to stop its behavior by artificially silencing the basal forebrain neurons, instead of presenting the stop signal. The results are an important addition to what scientists know about the fundamental mechanisms underlying an important brain function, disturbed in disorders in which impulse control is impaired.